New York : Graphix, 2013. 194 p : chiefly col. ill. ; 24 cm. Three fictional stories, told in graphic novel format, about soldiers in World War I, World War II, and the Vietnam War who were aided by combat dogs. Based on true stories. 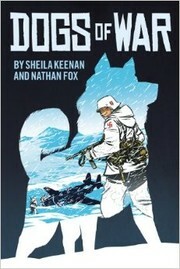 Dogs of war / by Sheila Keenan ; illustrated by Nathan Fox ; colors by Rico Renzi and Guy Major. World War, 1914-1918--Comic books, strips, etc. World War, 1939-1945--Comic books, strips, etc. Vietnam War, 1961-1975--Comic books, strips, etc. 100 ME:PersonalName 1 $a Personal name Keenan, Sheila. $c Statement of responsibility by Sheila Keenan ; illustrated by Nathan Fox ; colors by Rico Renzi and Guy Major. 505 ContentsNote 0 $a Formatted contents note Boots -- Loki -- Sheba. 520 Summary $a Summary, etc. note Three fictional stories, told in graphic novel format, about soldiers in World War I, World War II, and the Vietnam War who were aided by combat dogs. Based on true stories. $v Form subdivision Comic books, strips, etc. 650 Subj:Topic 0 $a Topical term Children&apos;s stories, American. 655 IT:Genre 0 $a Genre/form data or focus term Graphic novels.